With the rising usage of hydrogen peroxide (H2O2) in its vaporized form for decontamination, specifically in the healthcare sector, the demand for hydrogen peroxide measurement devices has been exhibiting a remarkable surge since the last few years. As the residual remains of hydrogen peroxide are just oxygen and water, the adoption of these devices is witnessing high growth in hospitals, laboratories, intensive care units (ICU), and pharmacies. Analysts at TMR predict that the adoption rate of hydrogen peroxide measurement devices will remain increasing over the coming years, influencing the market’s growth considerably. The growing emphasis on employee healthcare in enterprises and the rising awareness regarding the importance of improved indoor air quality will also augment the demand for these devices in the near future. In 2015, the global opportunity in hydrogen peroxide measurement stood at US$81.4 mn. Rising at a CAGR of 5.70% during the period from 2016 and 2024, it is estimated to worth US$133.3 mn by the end 2024. Overall, the worldwide market for hydrogen peroxide measurement looks adequately growing; however, the increasing availability of alternatives is anticipated to hamper the growth to some extent over the forthcoming years. Asia Pacific, Europe, North America, Latin America, and the Middle East and Africa are the main regional markets for hydrogen peroxide measurement devices. Europe led the global market in 2015 with a share of nearly 34%. A well-established and advanced healthcare infrastructure helped the region to acquire the leading position. Additionally, the presence of a large pool of market players is likely to assist the region in maintaining its leadership over the forthcoming years. The increasing adoption of HPV decontamination in pharmacies, healthcare facilities, and laboratories is also expected to boost the sale of these devices in Europe in the near future. In 2015, the total opportunity for hydrogen peroxide measurement devices was US$28 mn in Europe. Expanding at a CAGR of 6.0% between 2016 and 2024, it is likely to worth US$42.7 mn by the end of 2024. Hydrogen peroxide measurement finds most of its application in chemicals, healthcare, food and beverages, pharmaceuticals, laboratories, animal farming, HVAC systems, and freeze dryers, among which the healthcare segment has emerged as the leading consumer. The efficient decontamination, ensured by HPV decontamination systems, has boosted their installation in hospitals and laboratories substantially, thereby increasing the adoption of hydrogen peroxide measurement devices at large. Apart from this, the rising awareness pertaining to HPV decontamination, specifically in developed countries, is anticipated to fuel the demand for hydrogen peroxide measurement devices in the chemicals and pharmaceuticals industries over the next few years. Currently, Dragerwerk AG, Interscan Corp., and Analytical Technology Inc. are leading the global hydrogen peroxide measurement market. These companies are increasingly focusing on enhancing the experience of their consumers in order to gain a competitive edge over other participants. Other prominent market players are The Gwent Group and Picarro Inc.
Hydrogen peroxide (hereafter, H2O2) measurement devices are used for detection of hydrogen peroxide in gaseous and aqueous applications. Mostly, these devices are used in detection of hydrogen peroxide vapor (HPV) in the HPV decontamination applications. This is important, as the excess presence of HPV is unsafe to human exposure. Increasing use of hydrogen peroxide in decontamination process, and eco-friendly by-products (water and oxygen) of hydrogen peroxide are the key factors leading to the market growth of hydrogen peroxide measurement devices. This research report on the hydrogen peroxide measurement market provides detailed analysis of the hydrogen peroxide measurement devices and helps understanding the driving forces behind the popularity of hydrogen peroxide measurement devices in the market. 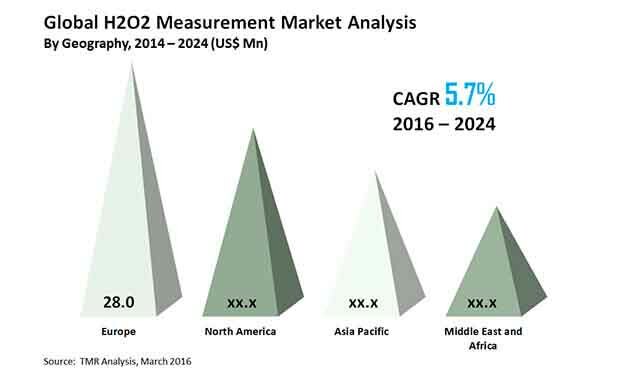 It also provides analysis of major sub-segments of the global hydrogen peroxide measurement market for the next nine years. This report includes extensive analysis of industry drivers, restraints, market trends, and market structure. The market study provides comprehensive assessment of stakeholder strategies and imperatives for succeeding in the business. The report has segregated the market based on product type, application, and geography. The research report provides a comprehensive assessment of stakeholder strategies, and the imperatives for succeeding in hydrogen peroxide measurement market. The report includes competitive analysis of various market segments based on product type and applications for hydrogen peroxide measurement devices, and in-depth cross-sectional analysis across different geographical segments of the hydrogen peroxide measurement market. In order to aid in strategic decision-making, the report also includes the winning strategies adopted by key players. The report segregates the hydrogen peroxide market based on different geographies into North America, Europe, Asia Pacific, Middle-east and Africa and Latin America. The hydrogen peroxide measurement market is segmented as follows.